Fear where does it come from? Which thoughts will we choose? Fear is all in our heads. It is our Thoughts! We only start feeling afraid after we have started thinking of something we are afraid of. For children with their vivid imaginations fearful thoughts can seem very real especially at night. A short prayer can help them release their fears and feel safe while alone in their beds. Growing up I attended Unity Church where I learned about the power of our thoughts and about the “Prayer for Protection” by James Dillet Freeman. My mom would say it with me at bed time and it helped me to feel protected if I had fearful or negative thoughts and to focus on something positive while I drifted off to sleep. When I had children of my own we included the prayer as part of our bedtime routine to help them feel protected too. The prayer is as follows…. Wherever we are god is and all is well. To me a prayer is one way to take what is troubling me and pass it over to something or someone bigger than myself to deal with. When using this prayer you could replace the word God with the higher power you or your child believe in and it would be just as powerful. My children always felt they were being taken care of and were safe when we said this prayer together as I tucked them in at night. They liked to end the prayer by putting a box of white light all around their bodies, their bed and their house to heal and protect them throughout the night. White light is the universal energy for healing and protection, my children would visualize it as an imaginary warm blanket of white energy around their body keeping them safe throughout the night. My son who loved to stall bedtime as much as possible would put white light around everyone and everything he knew so we eventually shortened his list to include the whole world. 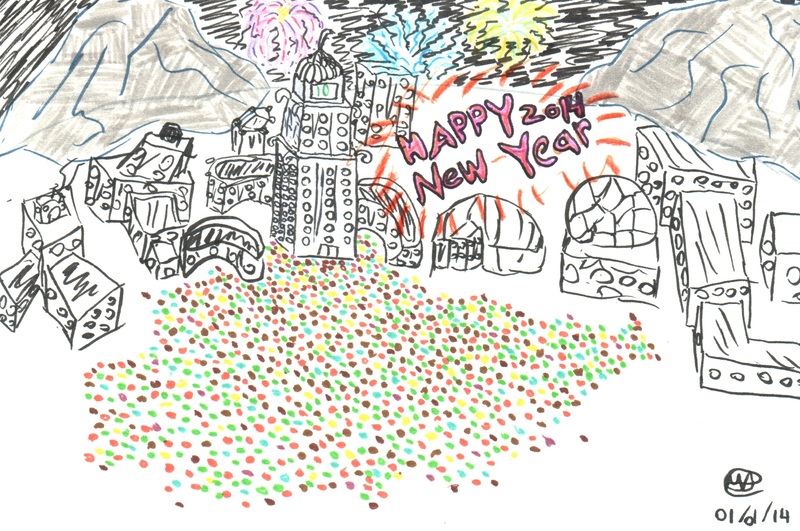 He liked the idea that while he was sleeping everyone in the world was safe too. 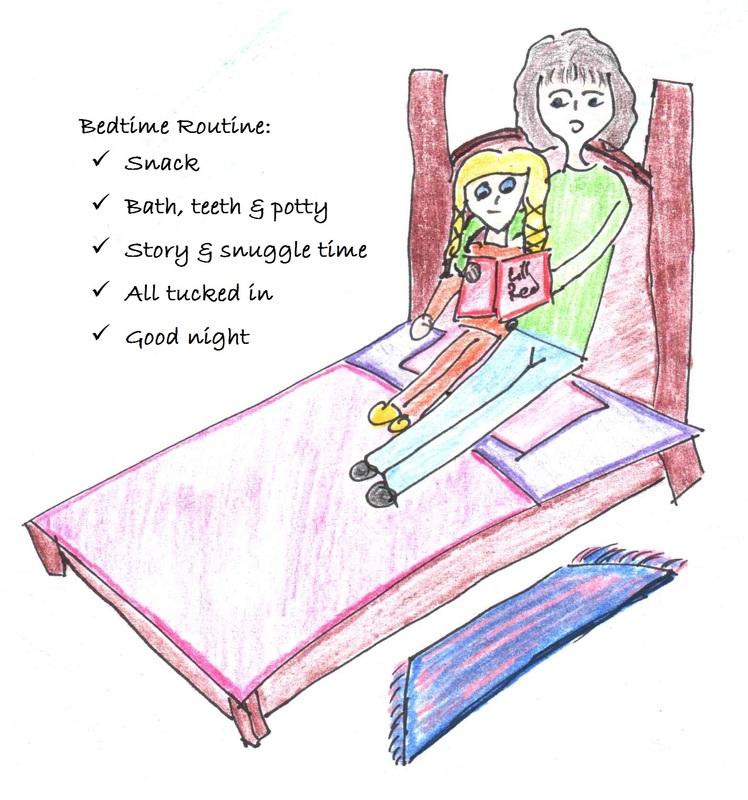 Bedtime Routine: Children Settle Faster and Feel Safer When They Have One! A good bedtime routine helps your child look forward to going to sleep. Bedtime can be a challenge for young children. They have spent their day running, playing and doing exciting high energy things and then we expect them to just turn off and go to sleep? Good luck Mom and Dad 🙂 A lot of children’s night time fears come from daytime stimulation. Images from TV shows or video games stay with a child especially if they were scary images. Turning off all electronics at least one hour or more before bed can give a child a break from stimulation and start to prepare them for sleep. When my kids were little it helped to have a relaxing bedtime routine to settle them down for the night. It usually took from 10 to 45 minutes depending on how much time we had at the end of our night. If it was still light outside I would first go around the house and close all the blinds so it felt like night inside. It is harder to go to sleep when the sun is still shining in their bedroom window. (I would highly recommend black out blinds in your child’s room for those long summer nights). Hungry kids have a hard time falling asleep because all they can think of is food. We would start our routine with a light snack my kids were always hungry around bedtime, a sliced apple, banana, piece of toast or small bowl of yogurt or cereal would fill them up till morning. If we were out and late coming home I would bring a snack so they could eat it on the way home and save some time. Bath time could be a relaxing, playtime however; if we were short on time it could be a quick in-out bath or even left to the next day. Pajamas, teeth brushed, potty break and we were ready for story time. Story time is a great way to relax for bed. Nothing like a snuggle with mom or dad on the couch and a good book to calm an excited child and settle their mind for sleep. (Just reading the story puts me to sleep.) If we were running late I would save story time to the end and make up a story for them while we had our 5 minute tuck in time in bed. My son loved my made up stories and I could usually think up some lesson that related to his day be it sharing more with his friends or being nice to others. Tuck in time was my children’s favorite part. I would tuck in the blankets snug all around them and lay with them for a few minutes saying our nightly prayer, talking quietly about their day, telling stories or giving them a back massage. Sometimes if they’d had an upsetting day and could not settle I would walk them through a mini meditation at the end to help them let go of their thoughts from the day and relax. Then I would turn on their night light or leave the door slightly open with the hall light on and place a couple of picture books on their bed they could look at if needed until they went to sleep. Children love routine, it helps them feel safe. However, it is also good to keep it flexible so they don’t get too stuck with the same thing and then have trouble settling for someone else like the babysitter when mom and dad finally get a date night. The Dark, my child is afraid how can I help? The Dark! The Dark! I’m afraid of the night! Mommy please, leave the door open for light. I see so many things in the dark. “AcK!” One just landed on my chin. Mommy their web is all over my bed! Please, may I sleep in yours instead? Oh why must it be so dark? Why can’t I have my sister’s spark? Now she, She’s not afraid of the dark. Like a baby in the womb. NOT ME! I’m in a Tomb! As great as mine I fear. So all my fears will go away. 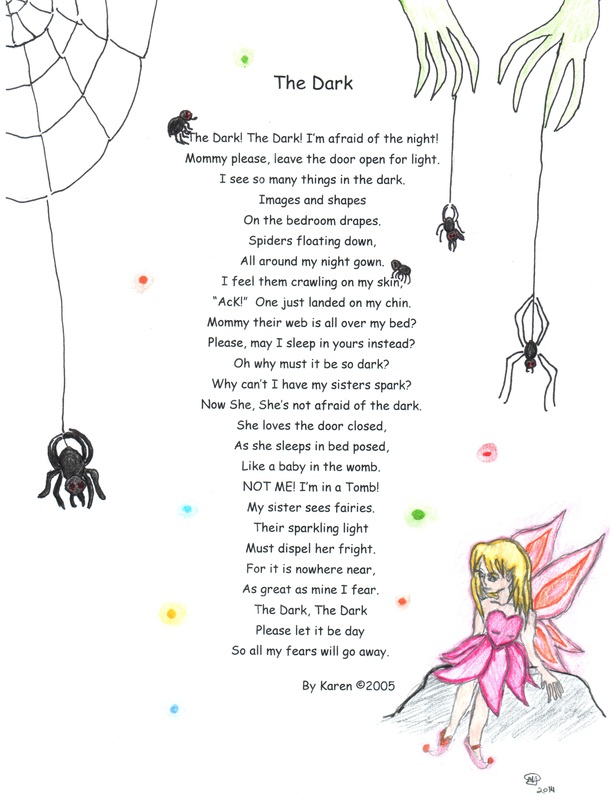 The dark can be a very scary place for children. Their imaginations run wild and can create all kinds of creepy visions in their darkened rooms. Then because the last thing we think about can sometimes influence our dreams they may have nightmares like the one in the poem. One night my oldest daughter Maria who was terrified of spiders, came running into our room whispering frantically, “Mommy, Mommy I am so scared. There are spiders all around my bed! Please make them go away!” I went into her room and she fearfully pointed to her top bunk and the spiders she could still see surrounding her bed. I couldn’t see anything but it was very real for her. I opened her window and made sweeping motions to sweep them all out the window while she pointed to the ones I missed until she could not see any more spiders. We said a quick prayer to keep them away, then made her a cozy spot on the floor beside my bed for her to sleep as there was no way she was going to go back to sleep in her bed in case we missed one. Sometimes the best place for a child to feel safe is right beside their mommy. I used to keep the kids old baby blankets in the hall closet so when one of them had a nightmare we could make a quick, cozy bed for them beside mine and they could sleep there the rest of the night. It was much more comfortable for them than me trying to squeeze into their bed and my bed was too small to fit three especially when one was a squirming child. Over the years I have come up with a number of ways to help my children feel safe. A lot of it is mind over matter. 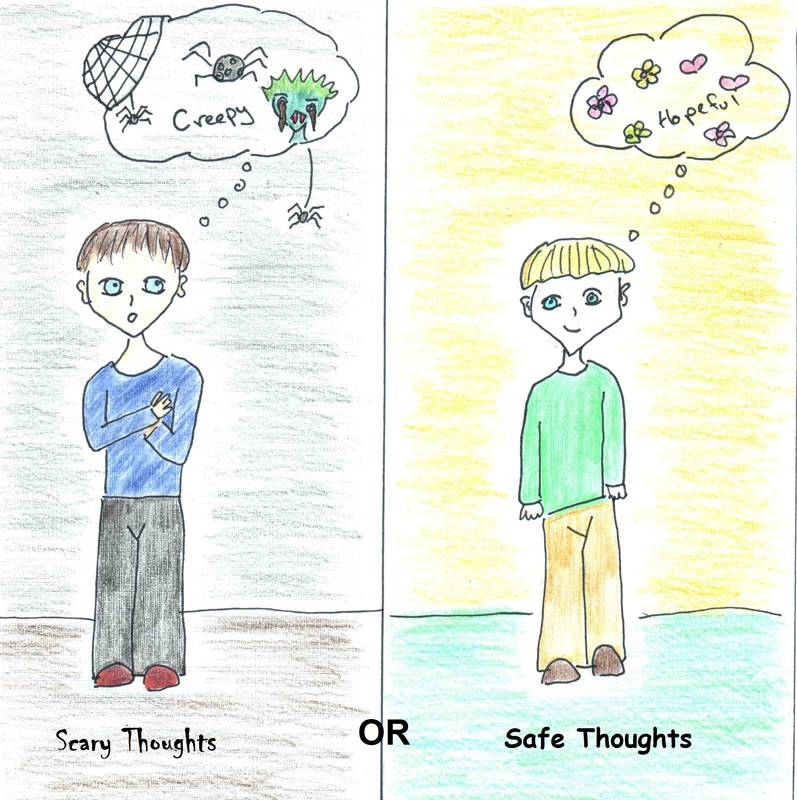 When a child is scared they need a positive or happy thought to replace the fearful one. Over the next few weeks I would like to share some of the methods I have tried when my children have been scared. If you have some suggestions that have worked for you and would like to share them please feel free to leave a comment. I always found the more ideas the better as what works with one child may not work with others.